Research tells us that we have only seconds to make a first impression on others, and most of us want to put our best foot forward during that time. 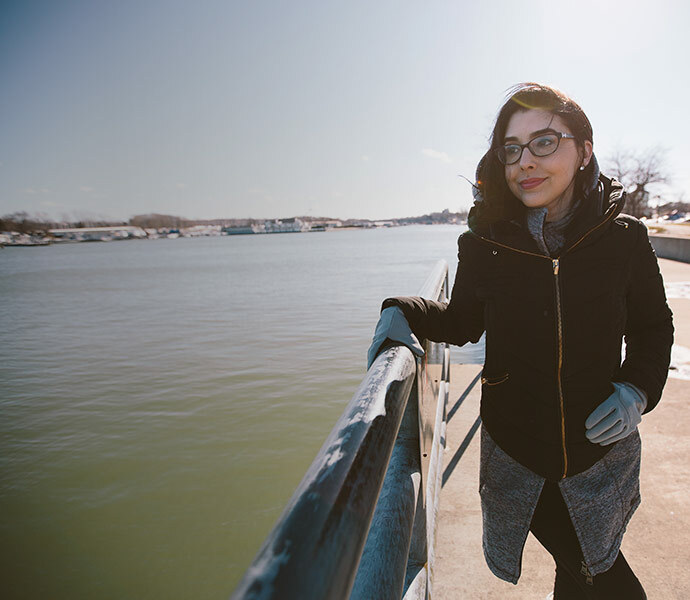 But what if you live with a chronic, visible skin condition that’s almost impossible to hide? For people like me who live with chronic idiopathic urticaria (CIU), or chronic hives, the desire to make a good impression on the outside world while being judged on our outer appearance can be tricky. Dealing with chronic hives can be frustrating and difficult at times, and because outbreaks are so visible to others, trying to combat the stigma can often prove more challenging than the condition itself. The shame that can come along with a chronic illness can leave scars that aren’t visible to those around us, but they can affect us long after the hives have cleared up. My family first started noticing my predisposition for hives shortly after I was born. I was already exhibiting other autoimmune issues such as asthma and allergies, and with CIU falling under the umbrella of an autoimmune disease, it made perfect sense — yet no one made the connection and a diagnosis was far off. Instead, it was mistakenly assumed that every outbreak of hives must be linked to an allergic reaction or specific allergen. Though a specific allergen can be the cause for hives in certain cases, chronic urticaria is idiopathic in up to 80 – 90 percent of cases, meaning the trigger is unknown. While it is true that some of my hive outbreaks (even today) are directly related to an allergen — such as when a kitten or puppy licks me, I eat seafood, or I touch certain types of metal — a severe outbreak in my 30s, which lasted several months, is what actually helped my allergist diagnose me with CIU. The outbreak began as red rash on my thigh that resembled heat rash and consisted of tiny pin-prick marks. Within 48 hours, the rash spread all over my body into large weals ranging from the size of a dime to the size of quarters. The flare-up was excruciating physically, as the hives caused burning and severe itching, making it uncomfortable to work or even sleep. 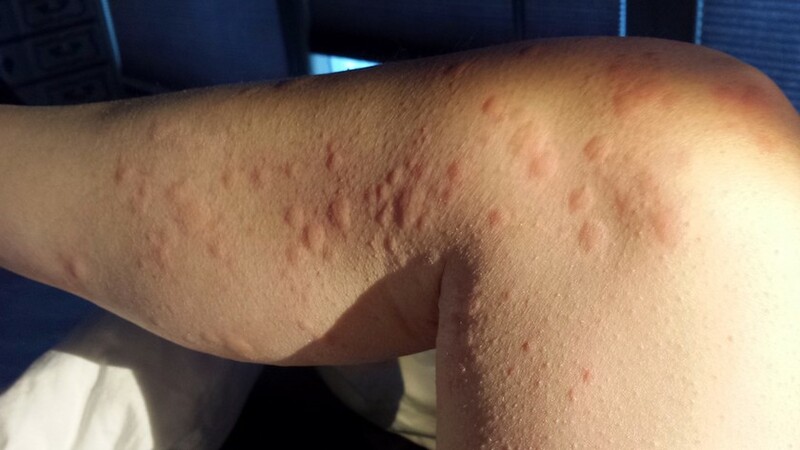 One of the worst aspects of this flare was that any movement caused more hives to erupt on my skin. Psychologically, the outbreak took its toll. First, it felt like it was never going to go away. Even after six weeks of multiple medications taken daily, the hives were not letting up. During her most severe outbreak, Marisa had hives all over her body for months. Going out in public was another story all together. I tried desperately to cover up, but when you have hundreds of hives covering your skin from your toes to your forehead, it’s almost impossible. The stares from people or that surprised look when they first see the hives was often the worst part of the entire experience of going out — in addition to the pain and itching that came with getting dressed and moving. I can understand people’s concerns about whether hives are contagious. To those who aren’t familiar with CIU, it can seem like a rash, and let’s face it, some rashes are extremely contagious. But CIU is not. And the reality that many are unaware that these types of hives even exist, and that they’re not transmittable, brings people like me to the importance of speaking out and sharing our stories with the world. Not everyone is going to come across an article or study on the condition, so I feel like it’s my mission in some way to explain what CIU is and how it affects people. During my severe outbreak, I also realized how important it was to stay positive and not let the depression that often comes with a chronic illness take control of my life. In fact, stress is one of the greatest triggers of CIU, and being in pain, not knowing when the flare would subside, and physically seeing the constant outbreaks on my skin were enormous sources of stress. Because of this, you can see how easy it is for a vicious cycle to begin in which stress leads to more outbreaks, which leads to more stress. Seeing a counselor was one of the best forms of self-care I added into my weekly regimen. Having a neutral, trusted party with whom I could share the ups and downs that come along with a chronic illness (I also have lupus in addition to CIU), was a crucial element in keeping my stress levels low. Today I implement other forms of self-care into my life, too, including restorative yoga, journaling, taking time to read, and visiting my local salt cave. I also schedule an appointment with my allergist immediately if I see any signs of another CIU outbreak, which helps me stay ahead of it in many cases. My advice for others dealing with chronic hives is to work with an allergist to see if you can determine any specific triggers. This is hard to pinpoint in many cases, but you could be that rare exception! Also, reach out to others who are dealing with the condition, whether through an in-person group, online forum, or private Facebook page. Lastly, don’t let the stigma that surrounds seeing a counselor stop you from seeking outside help. There are many invisible scars that can be left in the aftermath of a chronic illness flare-up, but having support and encouragement can help bring some healing on a psychological and emotional level. Watch Marisa’s chronic hives journey to learn more about how she's tracked her triggers and adapted to living with her condition. Marisa Zeppieri-Caruana is an author, journalist, former Mrs. New York, and founder of LupusChick.com, a New York-based nonprofit and award-winning website for lupus patients. She is the author of Lupus: Real Life, Real Patients, Real Talk and travels around the U.S. speaking on the topic of autoimmune disease on a regular basis. In her free time, she is an avid baker with a love for food photography and styling. Currently finishing her memoir, Marisa resides in New York with her husband, mom, and rescued terrier, Bogey.